Dog lover. Wife. Writer. Designer. Artist. Idealist. Creative. Maybe I’m just old school, but I really, really like the feeling of physically crossing off something on my to do list. So while I’ve tried lots and lots of personal productivity tools, I always come back to using a printed day planner to prioritize and plan my day-to-day activities. But I could never find one that I really liked. Bullet journaling was a good option, but the spreads took too much time to create, which is when I decided that it was time for me to (finally) put my designer hat on and make a solution that worked for me. The result of my efforts became my very first day customized planner. Every year, I’ve continued to evolve the tool to meet my needs as they shift. 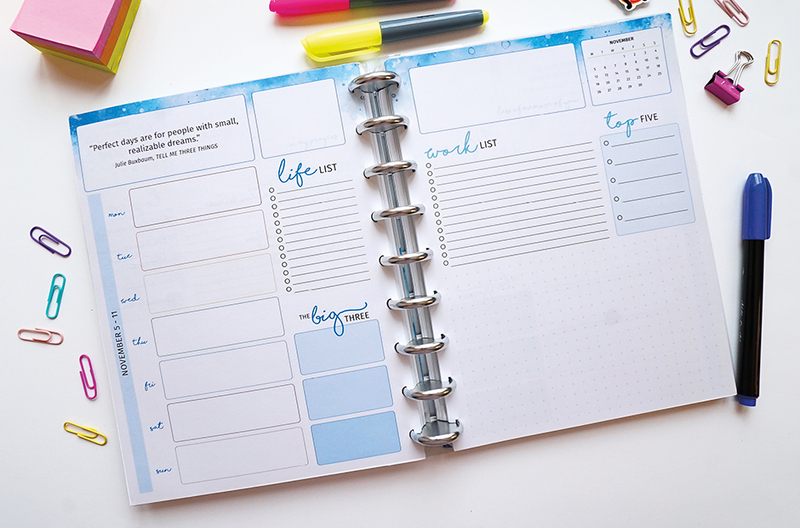 With my personal planner, I’ve been able to stay on top of weekly priorities, harness tools to control procrastination, and even improve my mental health. I knew from the research I’d done on productivity tools that one of the biggest keys to finding success with any system was that you had to like using the tool. When I dug deep into why I struggled with the day planners on the market, I realized A) they didn’t inspire me, and B) I could never get the layout to work for me. So once I decided to do this, I wanted to make sure I did it right. I spent some time figuring out how I’d been managing my work load outside of the day planner and then I began devising a system that looked similar. I looked at a lot of day planner spreads. I tested A LOT of different page layouts. The first year, my planner kind of resembled a fancy notebook, which was good, but didn’t rate highly for me on the “delight” factor. The second year, I increased the fun, introducing more color and new design elements and tweaked the functional layout. For 2018, I took it all a step further and started looking for ways to help me be more proactive. The final result for 2018 is pictured below. I think it was my best planner to date. I printed this at home, laminated the covers, and had Fedex Kinkos cut the whole thing down to size so I could get the nice bleeds on the pages. I used silver Arc discs from Staples to bind the pages and finished off the planner with a couple of arc system accessories (like pockets) from Staples. It honestly makes me irrationally joyful. I was able to fill the planner with little design details to suit my personality. I painted the background with acrylic ink, scanned the artwork and used it for the cover and inside spread backgrounds. You can’t see it well from the image, but the days of the week spaces are rainbow colored, which makes me happy, and they pop off the page nicely against the predominantly blue and grey text and spaces everywhere else. Everything has it’s place. I created small spaces for personal appointments or scheduled activities every day, I have one place where I can list life and work tasks that need to be done for the week. I can easily prioritize my to do lists and it gives me a place to keep track of big goals. I have also dedicated space to my spiritual health, allowing me to add a weekly focus in that area to keep focusing on being a better human. There’s still plenty of space for notes. I love writing down my musings and little snippets of conversations and wisdom I pick up through the week. The one thing I liked about bullet journaling was the little dots on the paper. They weren’t too intrusive but still made it easy for me to organize my thoughts, so I included my own “bullet journal” space on each weekly spread. They are not pictured here but I also have pages for monthly plans and more journaling/notes space. By far, my favorite part of this planner is the space I included on each spread for my favorite bookish quotes, most of which are from young adult books I’ve read, to inspire me to continue to focus on my own writing goals. I’ve got some fun changes in store for my 2019 planner. I can’t wait to show it to you in December! Do you use a day planner? What’s your favorite part?